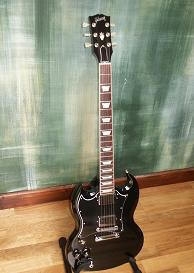 This guitar was a regular left handed SG from the main factory. J T Riboloff (see story of the Gibson Tony Iommi Signature pick-up) took it into his workshop in the Custom Shop and extended the fretboard, adding 2 frets to complete the full 2 octave span that Tony is used to. 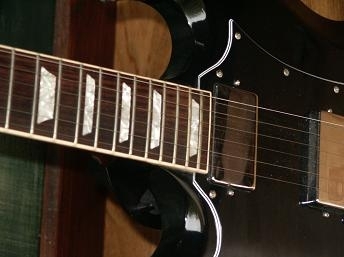 It is fitted with Iommi Signature pick-ups.